Upptäck några av Roms dolda skatter på denna lilla gruppturné som tar dig från arenorna i den antika republiken till den höga renässans sublima konst. Beundra heliga reliker och ett oavslutat mästerverk av Michelangelo i San Pietro in Vincoli kyrka och se var gladiatorer förberedde sig för kamp på Ludus Magnus nära Colosseum. 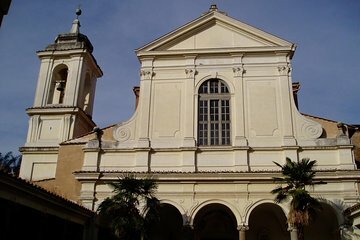 Ta sedan en underjordisk arkeologisk rundtur genom årtusenden romersk historia på den flerskiktiga basilikan San Clemente al Laterano. This tour was operated by FUN tours. Their office was easy to find - it was just a short distance from the Colosseum. Tour started at 10:30am which was nice time so we were not rushed in the morning to get to the tour office. As it turned out our family was the only ones who had booked this tour on this particular day. The tour guide, a young lady Andranna ? from Romania was simply amazing. She showed so much passion as she recounted the history of the sites. Starting with some ancient ruins near the Colosseum that were used to train Gladiators. We walked by the Victor Emmanuel Monument, then on to San Clemente Bascilia. We then preceded to go down four levels each representing a different time period of ancient Rome. This is truly amazing to see so much history over a long time period. High Recommended.